The combination of high strength-to-weight ratio, excellent mechanical properties, and corrosion resistance makes titanium grades the best material choice for many critical applications. Because the allotropic behavior of titanium allows diverse changes in microstructures by variations in thermomechanical processing, a broad range of properties and applications can be served with a minimum number of titanium grades. This is especially true for the titanium alloys with a two-phase a+ß crystal structure. The most widely used titanium grade is the Ti-6Al-4V alpha-beta alloy. This titanium alloy is well understood and is also very tolerant of variations in fabrication operations, despite its relatively poor room-temperature shaping and forming characteristics as compared to steel and aluminum. Titanium grade Ti-6Al-4V, which has limited section size hardenability, is most commonly used in the annealed condition. Commercially pure titanium grades 1, 2, 3 and 4 are available in bar and billet. The following titanium grades are also commonly available in bar and billet form: Ti-6Al-4V (grades 5 and 24), Ti-5Al-2.5Sn (grade 6), Ti-0.2Pd (grades 7 and 11), Ti-3Al-8V-6Cr-4Zr-4Mo (also known as BETA-C), Ti-6Al-2Sn-4Zr-2Mo, Ti-8Al- 1Mo-1V, Ti-6Al-6V-2Sn, Ti-10V-2Fe-3Al (TIMETAL 10.2.3), Ti-4Al-4Mo-2Sn (IMI 550), Ti-4Al-4Mo-4Sn-0.5Si-0.1C (IMI 551), Ti-15Mo (IMI 205) and TIMETAL 100. Titanium alloys available in casting form include commercially pure titanium grades 2, 3, 4, Ti-6Al-4V (grades 5 and 24), Ti-0.2Pd (grade 7), Ti-5Al-2.5Sn (grade 6), Ti-15V-3Cr-3Sn-3Al (TIMETAL 15.3), TIMETAL 1100 and Ti-5.8Al-4Sn-3.5Zr-0.7Nb (IMI 834). By application, titanium alloys can be divided into three main groups: corrosion resistant, high strength and high temperature grades. Three structural types of titanium alloys are alpha alloys, alpha-beta alloys, and beta or near-beta alloys. The Total Materia database includes more than 4 500 titanium grades along with another 350 000 metal alloys from all over the world. Their chemical compositions, mechanical and physical properties, cross-references and more are only a click away. 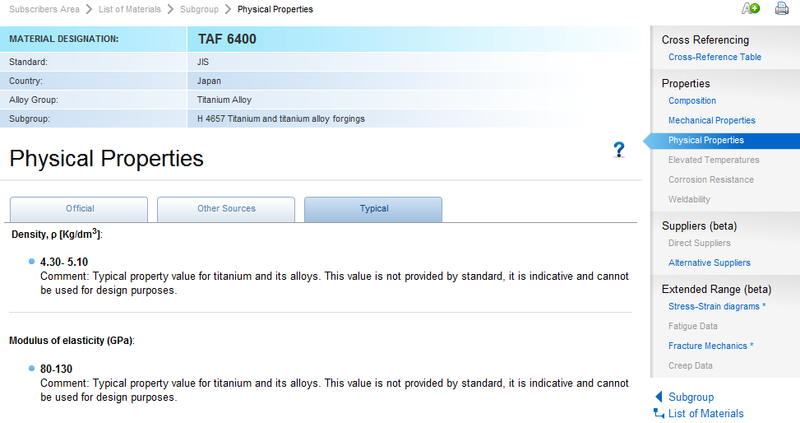 Finding a titanium grade in the database is very easy and takes seconds. For example, let’s look into the properties of the Japanese titanium grade TAF 6400. Simply use Quick Search at the Subscribers Home page and enter the designation. 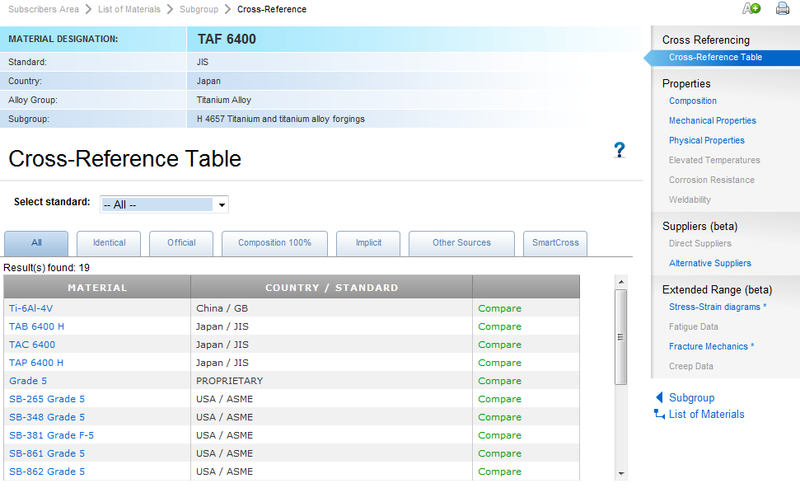 Selecting titanium from the Alloy Group list and Japan/JIS from the Standard list is optional. After clicking on the material, a list of subgroups appears. In Total Materia, the term “subgroups” refers to specifications that define properties of the titanium grade; in this case there is only one specification – JIS H 4657. Note that properties defined according to different specifications may differ significantly. 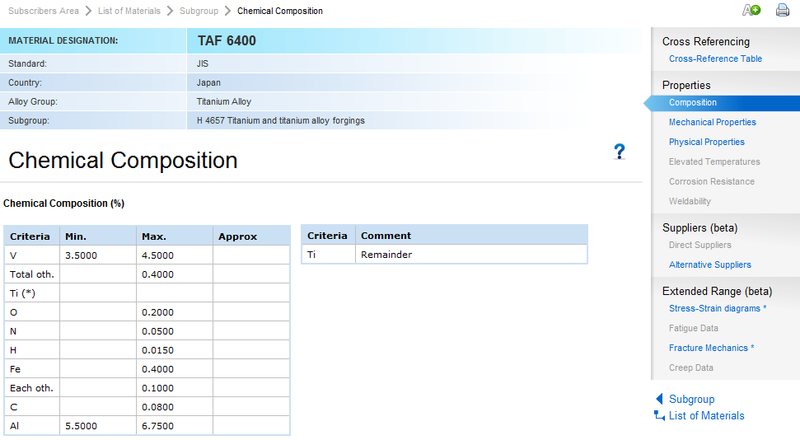 Composition, cross-references and properties of the titanium grade TAF 6400 can then be reviewed by clicking appropriate links, see examples below.